The Natural has finally gotten the DVD all-star treatment it so richly deserves in this new two-disc director’s cut edition. For those not already familiar with The Natural, it’s arguably the best baseball movie ever made. Magnificently photographed by Caleb Deschanel (The Passion of the Christ) and scored by Randy Newman (the Toy Story series), the movie itself is a magical experience. As a tribute to Deschanel’s genius, this movie elegantly captures the beauty of a bygone era and it even conjures the very aroma of a fresh, lush field playing host to a traveling carnival. As for the story, it’s based on the 1954 novel of the same name by Bernard Malamud. Having read the book shortly after the movie’s theatrical release, recollections were that the movie stayed extremely faithful to the book, right up until the ending, from which the movie deviates by a full 180 degrees. 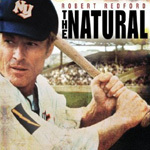 The Natural is Roy Hobbs (Robert Redford, The Sting); baseball is in his blood. He’s a first-class pitcher who can strike out the best in three pitches and he’s a slugger who can literally knock the cover off the ball. Fate interrupts Roy’s date with destiny; while on his way to start a career in the major leagues, Roy is shot by a mysterious woman. She’s a serial killer who has been making headlines by stalking and killing great sports players. Sidetracked, but not derailed, Roy returns to the majors 16 years after being hospitalized, firmly set on reclaiming the life he always dreamed of. Along the way, he faces new challenges and temptations that threaten to keep him from achieving baseball greatness. The Natural was originally released in 1984 and now, 23 years later, it’s quite a surprise there’s a director’s cut to be had. It’s an even bigger surprise how good the new cut is. The changes are not trivial. The retooled opening act zips along at a brisker pace. Now the movie starts with Roy going back to his boyhood home to pick up his baseball bat. It’s a very special bat; he made it when he was a kid and he named it Wonderboy. In the process, as he approaches the house and as he walks up the stairs to his old bedroom, flashbacks recall the death of his father, lightning striking the tree outside his bedroom window, and his moonlit soiree with his sweetheart, Iris (Glenn Close, Fatal Attraction). With newly restored flashbacks woven in at different points throughout the movie, the new cut more effectively captures the past that continuously haunts Roy. He’s a bit reclusive because of that past, in which his good nature and innocence were taken advantage of. One thing this director’s cut doesn’t change is the cinematic conclusion; it’s still a movie entrenched in the optimistic Reagan era 1980s and in terms of pure cinema, it’s the right ending to match the movie’s intrinsic magical tone. Sony is on a roll with a slew of great new DVD releases, including Rocky Balboa, that offer up terrific supplemental features that do exactly what they should do: they enhance the enjoyment of watching the movie itself. Such is also the case with this edition of The Natural. Disc 1 holds the director’s cut and an optional video introduction by director Barry Levinson. Barry recollects that roughly 20 minutes of footage was restored (the DVD jacket indicates 15 minutes, but who’s counting?). Even so, the feature itself is only six minutes longer than the original theatrical release. That’s a nifty trick, and it’s also a testament to the power of thoughtful editing. Disc 2 is a fantastic collection of informative material, only a portion of which covers the making of the movie. Here you will find great insight into all the true-life baseball lore that Malamud weaved into his story. There are also some great stories about the making of the movie, including Roger Towne writing last-minute script changes on toilet paper. When Lightning Strikes: Creating The Natural is a fantastic 50-minute look at the making of the movie. This is a series of three featurettes that get it right – particularly with its look at author Malamud and the true-life sources of inspiration behind his novel. Extra Innings is an 8-minute collection of interesting stories. The players here include President Ronald Reagan and Cubbie Ryne Sandberg; topics include editing, jersey colors, that mysterious serial killer, and Sandberg’s winning ways. Clubhouse Conversations opens up the field to the likes of Bob Costas, Yankee Jason Giambi, and others as they talk ball for about 15 minutes. A Natural Gunned Down: The Stalking of Eddie Waitkus is an excellent 17-minute look into the true-life story of baseball great Waitkus and his unfortunate run-in with a stalker. He was a rising star in the majors who got shot but a woman overwhelmed by her infatuation with the baseball player. Nonetheless, he still made it back to the majors and managed an inspiring career. Knights in Shining Armor: The Mythology of The Natural provides an excellent 10-minute look at the classic mythological storytelling aspects of The Natural. This one in particular is the kind of feature that makes going back through the movie even more enjoyable. The Heart of The Natural is a 45-minute documentary that was included on the original DVD release. It features Cal Ripken, Jr., who talks about his father, “the gift,” and baseball. Note: Since this is a different cut of the movie, the one shortcoming in the set is the lack of the original theatrical version. Sure, the original disc, which sports menus that look like they were designed on a Commodore 64, is still available. Including a fresh DVD transfer of the theatrical release would have been a nice touch, but, given the otherwise outstanding quality of this release, it’s perhaps a minor quibble. The new cut’s presentation was mastered in high definition and features an excellent 1.85:1 anamorphic transfer supervised by Caleb Deschanel. The Natural can now finally be seen on home video with the correct aspect ratio. The original DVD (and its laserdisc predecessor) featured a transfer that cropped off a wee bit too much on the sides. It’s nice to have those millimeters of Deschanel’s exemplary work back on view. The feature also boasts a rich new Dolby Digital 5.1 soundtrack in English, Japanese, and Portuguese. In addition, subtitles are offered in English, Japanese, French, and Portuguese. First up at bat is the new director’s cut itself. The first time through, also check out Levinson’s brief introduction to help set the stage. Next move over to Disc 2. All the features here deserve a viewing, so simply go through the lineup on the menu, which nicely balances topics between reality and fantasy. Of course, The Heart of The Natural is a must only for those who haven’t already seen it on the previous DVD release.